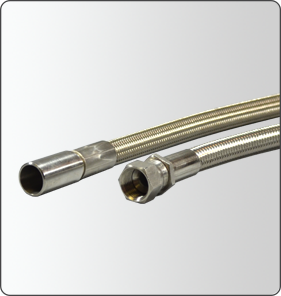 This hose is constructed with a seamless PTFE tube reinforced with 316 stainless steel braid and crimp style fittings. It is rated for medium pressure and full vacuum applications. The Teflon® tube will solve many piping and product transfer issues, especially with "problem" fluids such as: acids, caustics, solvents, and other harsh chemicals. The reinforcing braid is corrosion resistant and provides crush resistance. These hoses are available with a wide variety of end fittings (including flared thru) and are suitable for applications in the pharmaceutical, chemical, and the food and beverage industries. Convoluted Tube: The open pitch, helical convolute design allows for smooth product flow, easy cleaning and a tighter bend radius. Smooth Tube: The full I.D. allows for superior flow characteristics and easy clean-in-place.